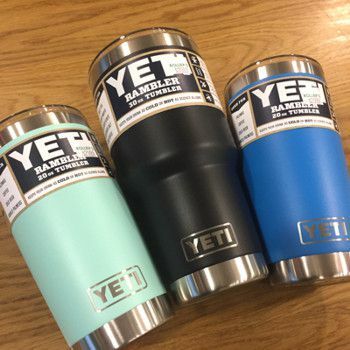 New this spring is a more colorful Yeti rambler! The classic 20 oz stainless steel rambler has been wrapped up with a DuraCoat finish, making them even more durable, easier to grip and, of course, more fun than ever before. Yeti 20 oz ramblers are now available in seafoam, bright Tahoe blue, black, and olive green. Despite the added color, you are still getting the same great double-walled insulation that you expect from a Yeti travel mug. The heavy insulation means that there is no-sweat even among the hot summer sun. The wide mouth stainless steel travel mug is easy to clean and easy to drink from. Stop by and see these new colors on display by our parking lot registers!